I looked up from my homework early in the evening last Monday with a realization: “Since it’s dark now, it must be Rosh Hashanah.” One of my host brothers, Milan, was helping me wade through the complexities of Serbian noun cases, but when he heard this, he asked what the traditional Hebrew greeting would be for this holy day. He carefully took it down, gathered the rest of the family around, and led us in a collective “Shanah Tove.” They had more questions for me about the holiday’s traditions, and this is how--the next morning, when I came down for breakfast--I found apples and honey waiting for me on the table. 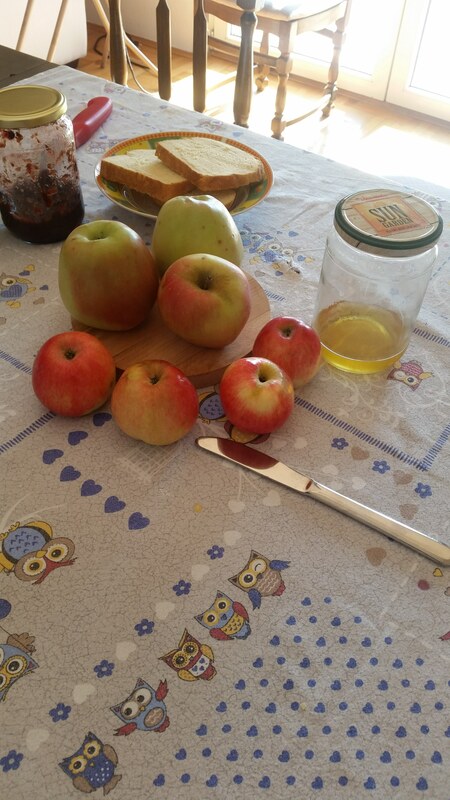 As I had explained to my host family the night before, Rosh Hashanah is the beginning of Jewish new year celebrations, and typically apples and honey are eaten along with other round and sweet foods (because the year comes around and is hopefully sweet). The new year does involve some reflection too--ten days of it, in fact--and ends with another holy day, one of fasting, called Yom Kippur. I was incredibly touched that my host family had taken the time to learn about my religion and even to pick up on a detail as small as the apples in an explanation of such a complicated holiday. At the same time, I felt a touch of disappointment. Since I had second shift at school that week and classes in the afternoon, no one was home to help me celebrate. Everyone had left for the day, and I was eating alone. 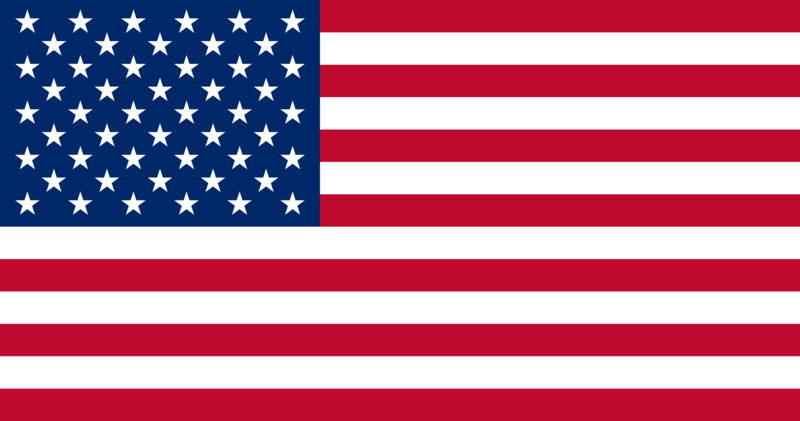 I poured the same amount of honey as I usually did when celebrating in the U.S., however--enough for plenty of family and friends. At that moment, even as I was warmed and comforted by my host family’s thoughtfulness, it struck me that the year on which I was reflecting--the people, the routines, the places--had very little in common with the year about to begin. All the same, I sent my natural family a happy new year text, stuck the rest of the honey in the fridge, and went about my day. I didn’t think about it again until I arrived home and went to greet my host family in the living room. They had slightly devious looks on their faces and told me to turn around. I’ll pause at this point to note that our dining room and living room are attached, and not through any tiny doorway either. This relevant because, in entering the living room, I had just walked past a table covered with different sweets and with apples and honey in the center. 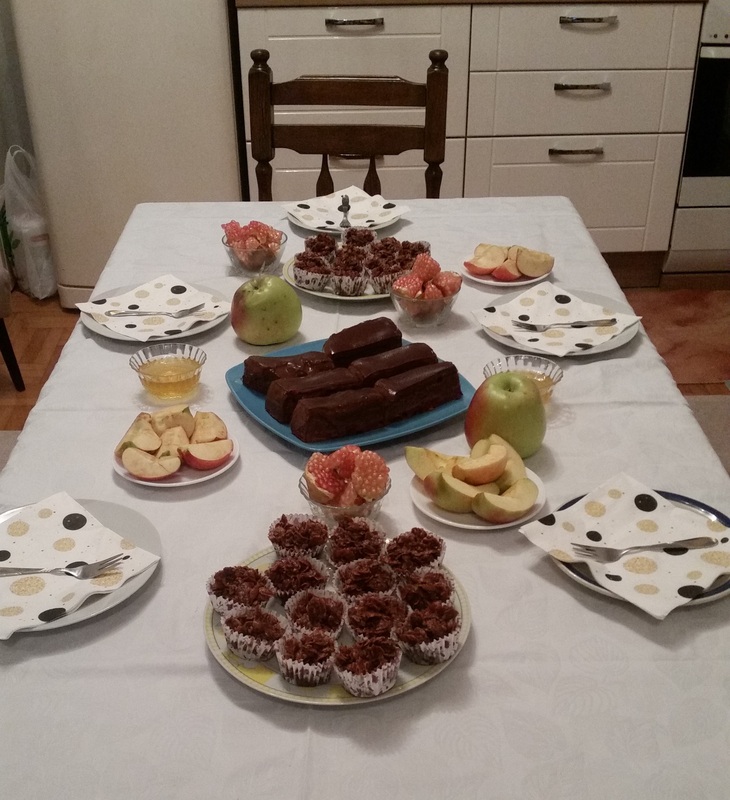 In honor of Rosh Hashanah, my host family had prepared a “sweet dinner,” including some traditional Jewish foods they researched and some Serbian desserts as well. 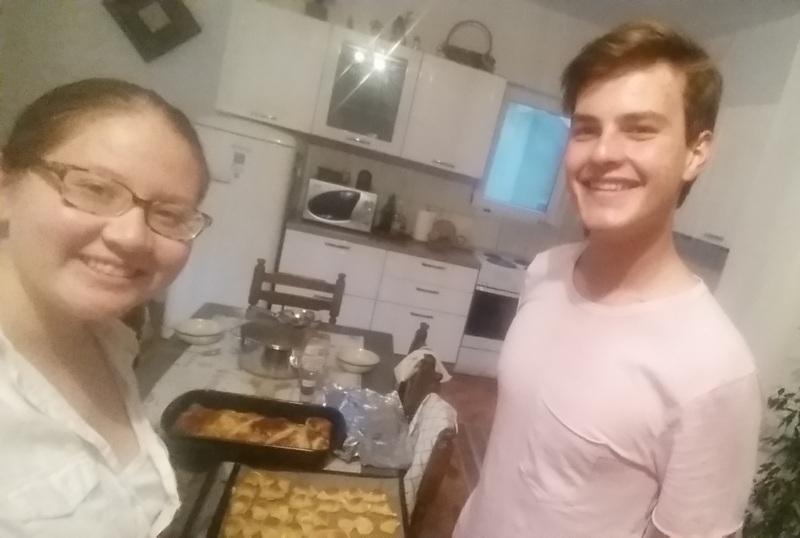 My host brother Ognjen had introduced to me kolač, and Milan had previously told me about a dessert made with Cornflakes, which had seemed dubious to me until I tried one! After we had eaten our fill, we took a plate over to a neighbor even though it was well past 9pm; and in return, he came home with us, visiting with us for over an hour. 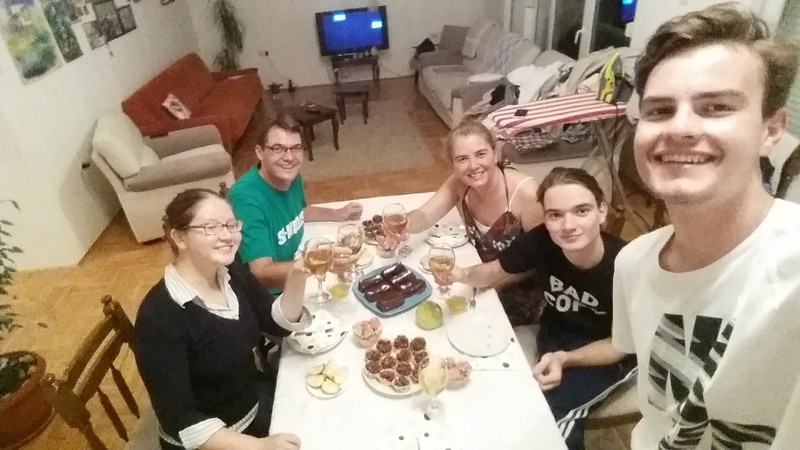 At the beginning of this new year (in more ways than one), my host family has given me something beyond just an opportunity to follow my traditions--they fully threw themselves into understanding and embracing my holiday, my cultural values, what makes me. And they even added their own traditions into the mix. They showed me that I could continue to bring the most wonderful parts of my past year in the U.S. into my next year, living here in Bosnia. Instead of a strange year of pause or limbo, this year was starting to feel more like another integral piece of my life. Ten days later, when my host family insisted on fasting with me for Yom Kippur, we broke our fast with traditional Serbian kiefla… stuffed with a very typically Jewish filling of mashed potatoes.